The Arm Force Field Method is Critical to your Industry | SantosHuman, Inc. 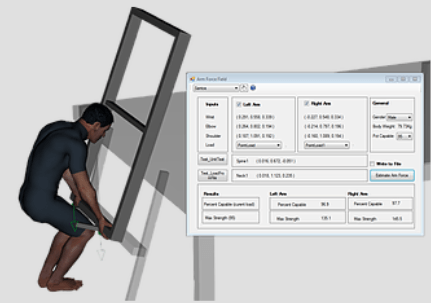 The most accurate and extensively validated method of predicting exposure to risk of injury for tasks involving manual arm strength available today is called the Arm Force Field (AFF). This method is now available through the Santos® AFF Plug-In and for a limited time, $960 provides a 1 year license of Santos® Lite bundled with the Santos® AFF Plug-In.